Atlantic Beach, FL —Col. George Grigsby McKnight, 85, of Atlantic Beach, FL, formerly of Hilton Head, S.C., and husband of the former Suzanne Sexton of St. Petersburg, FL died Friday, Jan. 18, 2019, at the Fleet Landing Continuing Care Center in Atlantic Beach. The center provided McKnight nearly two years of supportive care for psychological and physical wounds resulting from captivity in the Vietnam War. Colonel McKnight was a highly decorated Vietnam prisoner of war (POW) whose personal heroic actions resulting from his capture on Nov. 6, 1965 were recognized after his release on February 12, 1973 during Operation Homecoming. During his 7 1/2 years of captivity McKnight was incarcerated first in the Hanoi Hilton and was noted for his fierce resistance to his captors and their methods of torture. The then-Captain McKnight escaped from his solitary confinement cell on Oct. 12, 1967 by removing the door bolt brackets, knowing the escape attempt could result in severe reprisal or the loss of his life. He was joined by a fellow POW, Navy Lt. George Coker, as they made it through a section of housing, then on to the Red River where they swam toward the Gulf of Tonkin throughout the night. The next morning, they were recaptured, severely beaten, and put into solitary confinement for two- and one-half years where repeated beatings continued. They were later transferred to a prison in Hanoi across the Red River called Alcatraz by the POW’s where the 11 senior officers (among them Admiral James Stockdale, Admiral Jeremiah Denton and obstinate junior officers such as McKnight and Coker) were kept in solitary confinement. All were subjected to isolation and continued torture during the remaining years of captivity. Both officers after release were awarded the Air Force Cross (McKnight) and the Navy Cross (Coker) for their heroic efforts. 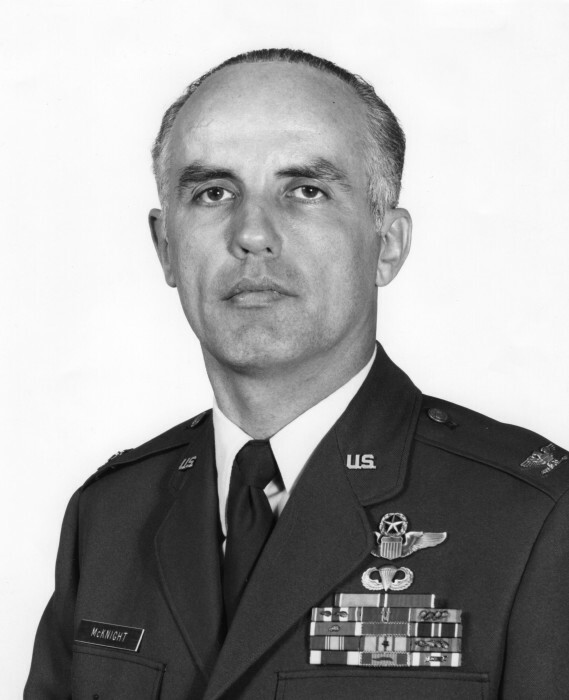 Part of McKnight’s Air Force citation reads: “Through his extraordinary heroism and aggressiveness in the face of the enemy, Colonel McKnight reflected the highest credit upon himself and the United States Air Force.” His awards include the Air Force Cross, the Silver Star with three devices, the Legion of Merit, the Bronze Star with Combat V, two Purple Hearts and additional unit, service and campaign medals. When asked in later years about his indomitable bravery and resolve as a POW, McKnight attributed his strength came through his strong faith in God and the teachings of the Jesuit Priests at St. Martin’s High School in Washington state. He recalled his spirit being strongly reinforced when he found a piece of string in the prison courtyard. McKnight took the string back to his cell and knotted it into a rosary he used daily to reinforce his faith. Each night he stuffed the rosary string into a crack on his cell wall so his captors would not find it. Colonel McKnight was born on Feb. 19, 1933 in Berkeley, Calif. to the late Elwood McKnight and the late Jane Grigsby McKnight. He was preceded in death by sisters Luann and Kathleen McKnight. McKnight was raised in Alaska by his grandparents until he enrolled in St. Martin’s High School in Washington state. He graduated from the University of Oregon and received his Master of Science from Auburn University while at Air War College in Montgomery, Alabama after returning from Vietnam. While studying at Air War College, McKnight met and married Capt. Suzanne Sexton, Nurse Corps, USAF in 1974. Their assignments took them to England, the Netherlands, the Democratic Republic of the Congo (Zaire) and Canada. McKnight retired in 1986. Colonel McKnight is survived by members of the Sexton family: mother in law Betty Sexton (Mrs. John M. Sexton) St. Petersburg; brother/sister in law: J. Dennis and Virginia Sexton; nephew Michael Sexton and children: (Sean T. and wife Angelica Sexton; Kathryn Sexton) St. Petersburg: nephew Sean D. and Fran Allyson Sexton (Alec Sexton) Lincoln University, Pennsylvania. A Memorial Mass will be celebrated at 11:30 a.m., Sat., January 26, 2019 in St. John the Baptist Catholic Church, Atlantic Beach, Florida. Interment with full honors will be held later at Arlington National Cemetery, Virginia. In lieu of flowers the family requests memorials be directed toward Wounded Warrior Project or K9s for Warriors (Ponte Vedra, FL).